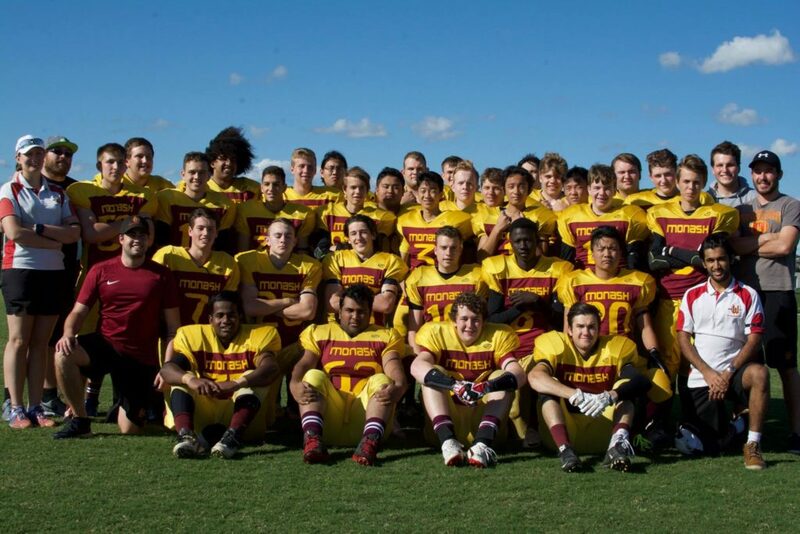 The final game of the junior Warriors 2016 season saw them in the Vicbowl with a matchup against the Melbourne Uni Lions. For the Warriors a victory would mean a fairytale finish to the perfect season, for the Lions it would mean history with a 3-Peat which had never been done at Junior level. The two teams previously played in week 2 in a hard fought but mistake filled game in which the warriors were just able to hold on to win 12-6. 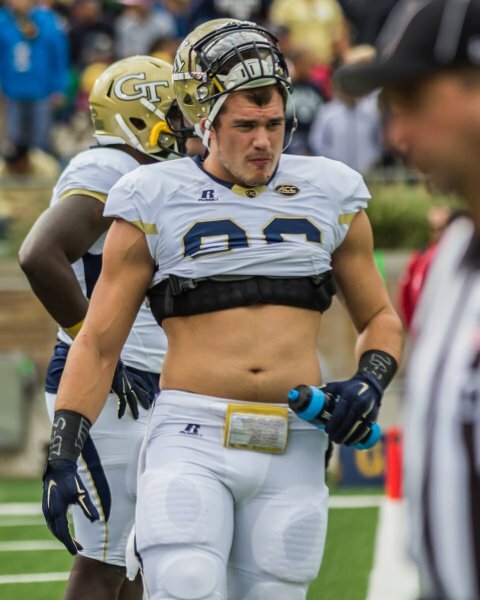 Jonathan Keusgen was named the game day captain for the Vicbowl as a reward for his hard work, consistency and excellent performance, both on and off the field during the 2016 season and he delivered well with a combined Pre-game speech with Max Abrahams that fired all the boys up and got everyone ready to go. 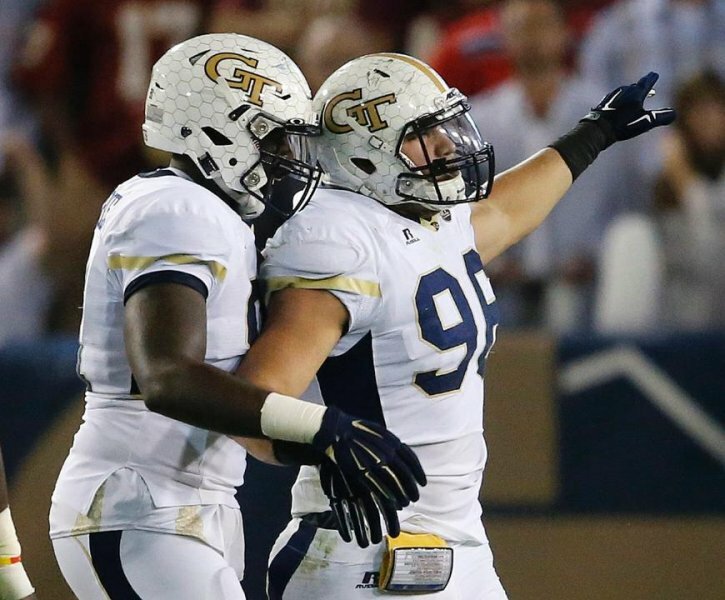 The game started off as expected, with both teams a little nervy on offense, with bad snaps, missed blocks and uncharacteristic fumbles that led to both teams having early three and outs on their first drives. 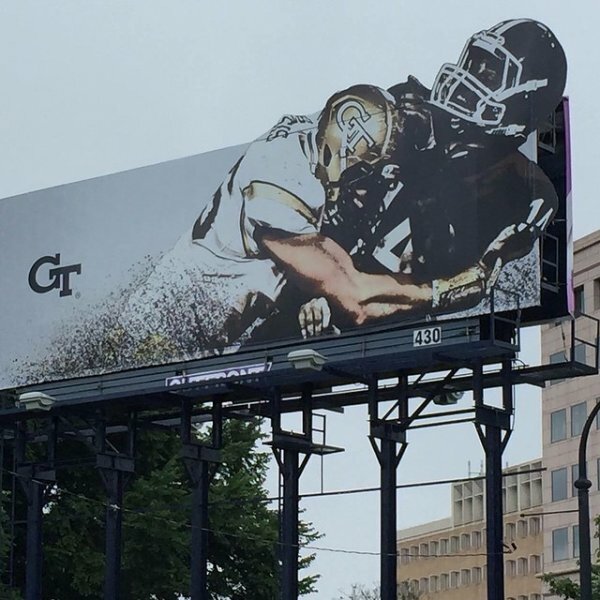 However on their second drive of the game our high powered offense showed why they have been the highest rated offense of the year, driving the ball down the field with big runs by both RB Anton Maksoutov and QB Nick Whitehead. This placed us in the red zone and after a few plays we punched in the first score with a brilliant scramble from QB Nick Whitehead to bring up a 6-0 lead midway through the first quarter. 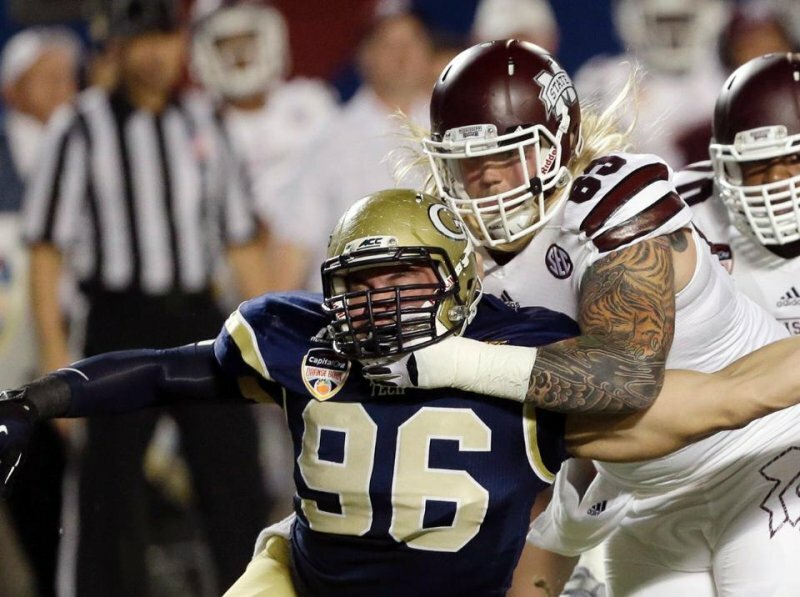 The defense again was stout against the run giving very little to the Lions offense, and when the Lions faked a punt on 4th and 5, Jono Keusgen stepped up and made a key tackle three yards short of the first down marker, giving the ball back to the offense. We wasted little time running a WR reverse to offensive weapon Ben McGaw, who proceeded to take it 50 yards basically untouched to the end zone. DL/FB Josh Deakin punched in the 2 pt Conversion to give the warriors a 14-0 lead at the end of the first quarter. 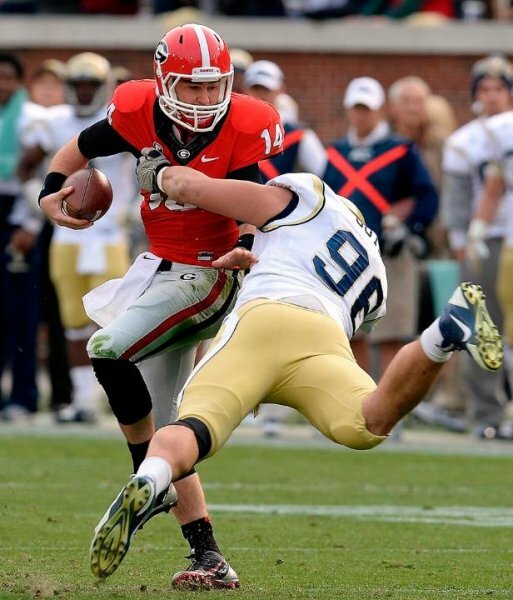 The second quarter began and this saw both teams struggle offensively with very few yards gained by either team. With less than 1 minute 30 in the half the lions decided they were content with a scoreless quarter for both teams and began to run the ball deep in their own territory. However our defense had other plans when deep in the middle of a big pile all of a sudden the ball popped out and CB Jed Melican scooped it up and ran it to the house for a momentum gaining play that put the warriors up 20-0. At the halftime break as coaches we couldn’t have been more proud of the team with the defense having played the best half of football they had seen all season and although the offense faltered in the 2nd quarter, they had started really well and had shown they could move the ball against what was considered by outsiders, the best defense in the league (of course we believed our defense was the best in the league). After a quick break the 3rd quarter began and our defense continued their dominance forcing a quick 3 and out and giving the ball back to the offense. 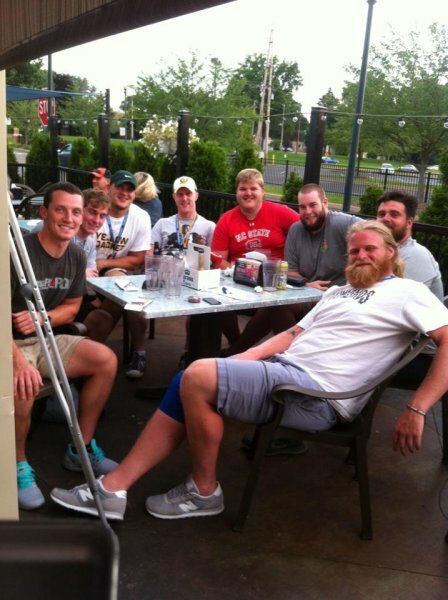 After a quick consultation with assistants Kieren Marini and Matt Morgan, we decided that we wanted to absolutely sink the hopes of the Lions early in the 2nd half, so on the first play of offense we ran a WR reverse Pass with WR and Backup QB Jordan “JVB” Van Buuren throwing a deep bomb to receiver Ben McGaw. Unfortunately the ball was misjudged by Ben and fell incomplete. After that unsuccessful attempt we went back to basics with some power running by RB Anton Maksoutov and FB Henry Malouf, and we marched the ball down the field to the 1 yard line. After a few plays and a few lost yards we eventually extended the lead with a play action pass from QB Nick Whitehead to WR Ben McGaw on the edge of the end zone. The Warriors again punched in the 2 pt. conversion with a short pass to Anton Maksoutov extending their lead to 28-0. The scores remained unchanged until midway through the 4th quarter when the Melbourne Uni Lions QB connected on a deep pass to the slot receiver who made an outstanding one handed catch and outran the rest of the defense on his way to the end zone to put the lions in the board 28-6. On the next drive QB Nick Whitehead was suffering in his own words from, “the worst cramps of his life”, and had to come off the field. 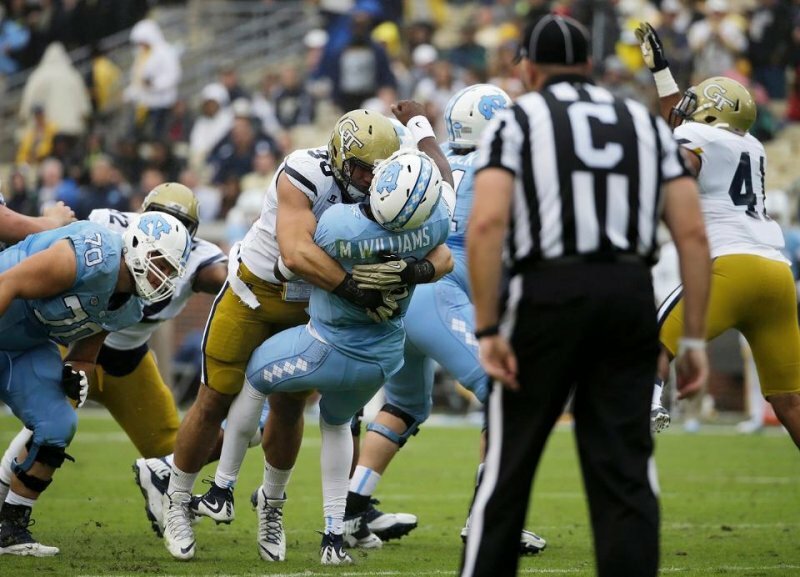 This put Backup QB Jordan in and he continued where Nick left off, driving the ball down the field and connecting on a TD pass to TE Vish Sivakumar, who had been a constant presence in the end zone all year. 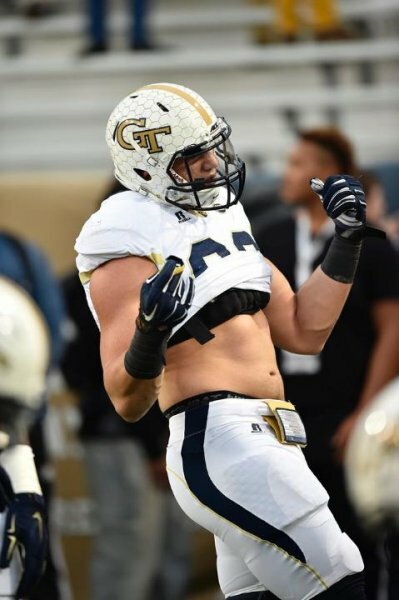 Since I had promised him I would, I allowed DL Josh Deakin who was in his final year of juniors to go in at QB and run a QB sneak into the end zone to convert to 2 pt attempt and extend the lead to 36-6. With less than 2 minutes to play the Lions had run out of options and in attempting to pass deep down the field were intercepted by LB Dmitri Maksoutov who returned it to the house to put the icing on the cake of our Vicbowl win and extend the lead to the eventual winning margin of 42-6. The Lions tried to make something out of nothing with a lateral on the ensuing Kickoff which was fumbled and recovered by the Warriors special teams unit which had been outstanding all year long. This allowed me to get all the top age players onto the field for one last time together. 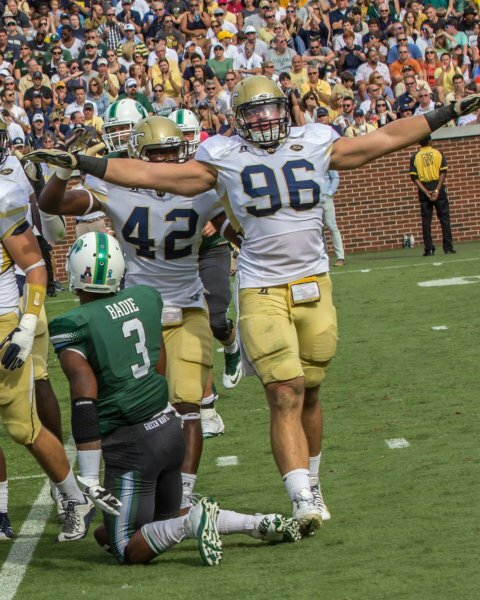 So with DL Jomo Kigotho and Ben McGaw at WR, DL Josh Deakin and G Edmond Jin at Guard, WR Jackson Crook at RB and Vish Sivakumar at TE we entered victory formation and knelt the ball to end the game. 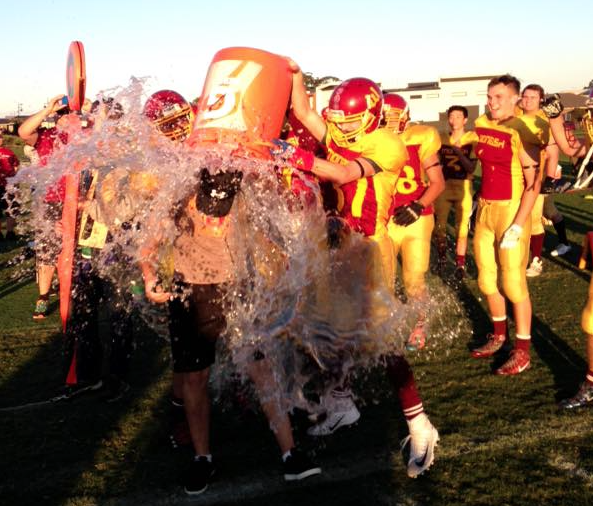 Huge celebrations began with the excitement of winning our first junior Vicbowl in 7 years, with WR Ben McGaw and QB Nick Whitehead absolutely covering me in Gatorade. 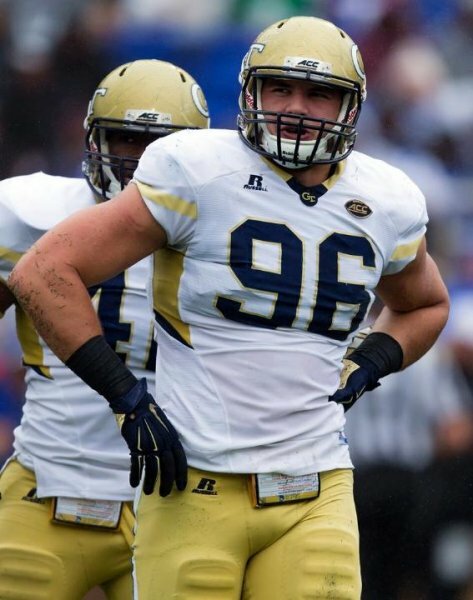 After the game all the coaches decided that although there were many standout players, in a game in which the defense dominated the game MVP was awarded to LB Dmitri Maksoutov, as he had an amazing game all day with an estimated 20+ tackles and the pick six that sealed the game. WR Ben McGaw won the official award for Vicbowl MVP for his efforts on the day with over 100 all-purpose yards, and multiple big punt returns. 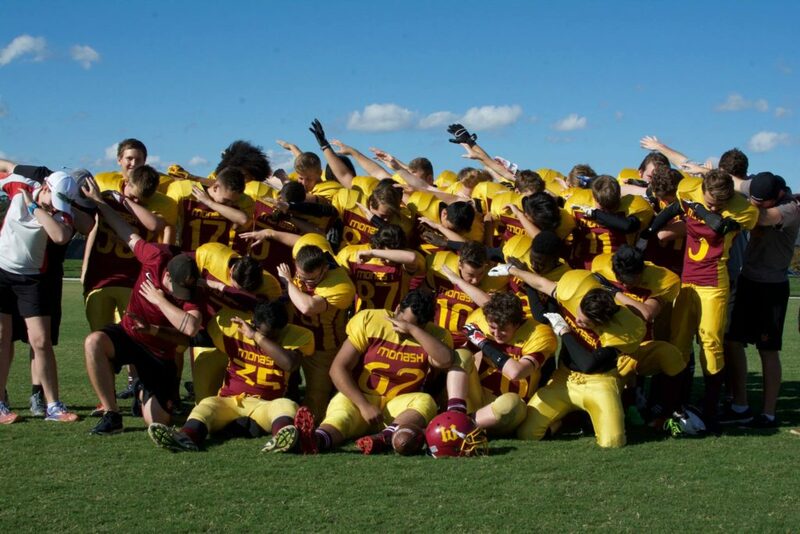 The undefeated season was capped off with a massive victory in the Vicbowl in what will go down as one of the best seasons the Junior Warriors have had up to date. We couldn’t be prouder of the team’s performance all year and we hope to see all eligible players return to defend the title next year as well as all the top age players stepping up to seniors and having instant impacts at the senior level in both Barbarians and Warriors. 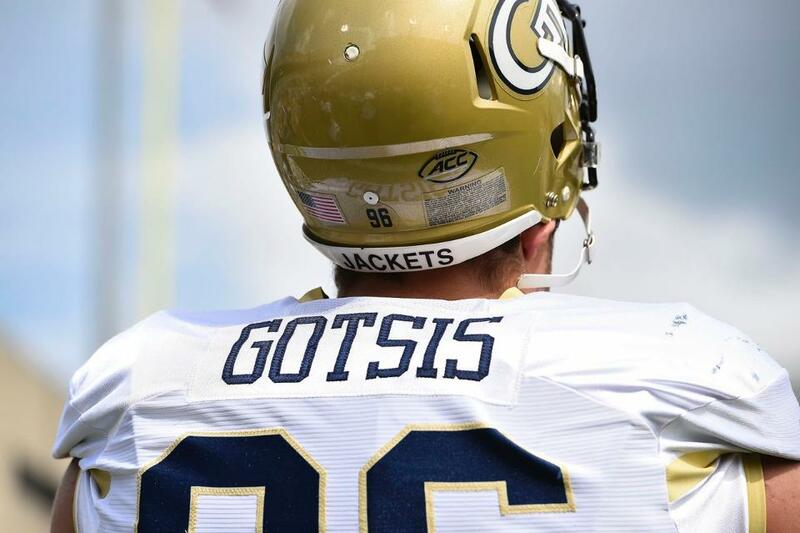 From Melbourne to the Mile High City, Adam Gotsis’s path to the NFL has been an exciting one for our Gridiron Club. 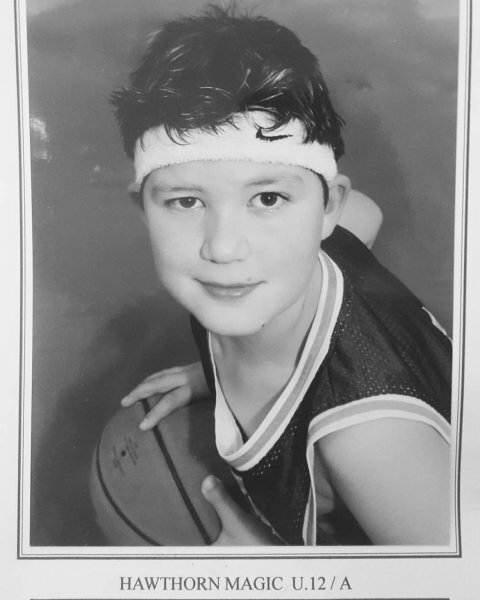 Adam played 4 years in our Junior program where he developed under coaches Dan Levin and Heather Buzza and one season for the Senior team under Head Coach Ralph Maggio. 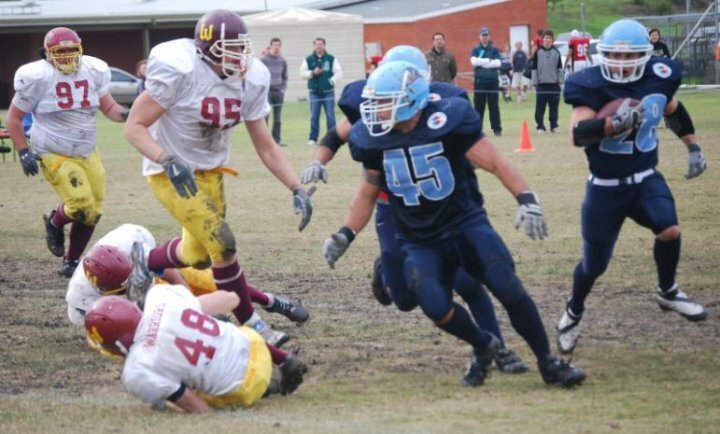 Whilst also dominating the local Gridiron Victoria competition, Adam also represented Victoria at both Junior and Senior level and represented Australia in the 2011 IFAF World Cup. 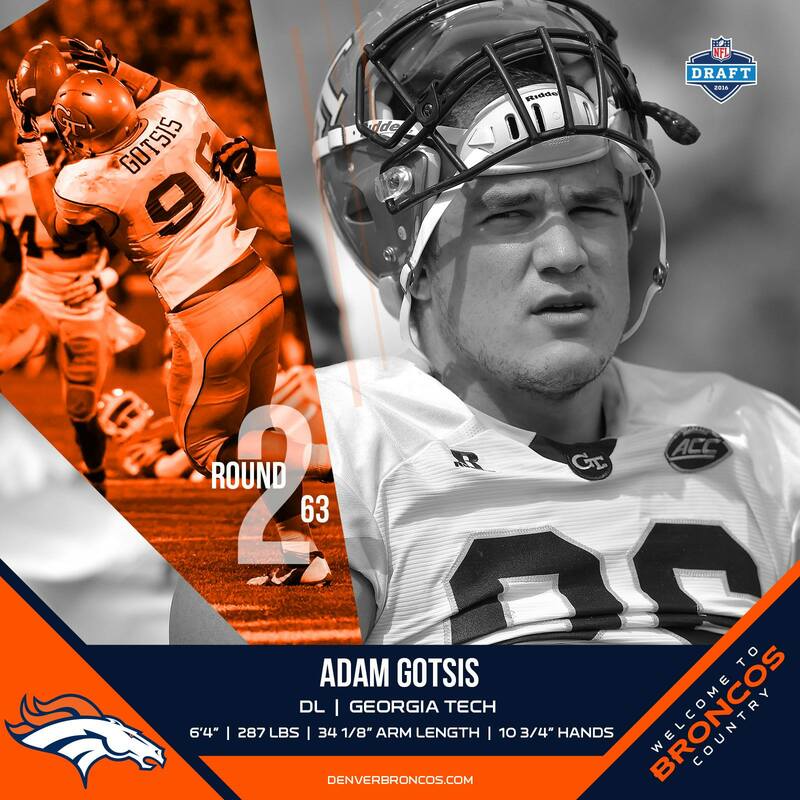 Adam was selected with the 63rd pick in the second round by the 2016 Super Bowl Champion Denver Broncos. The capital of Colorado and Population of 649,495, Denver is nicknamed the Mile High City because its official elevation is exactly one mile (5,280 ft or 1,610 m) above sea level, making it one of the highest major cities in the United States..
Adam will now have the chance to play for a Super Bowl winning team coached by Gary Kubiak and Wade Phillips and will no doubt develop with mentors Von Miller and Derek Wolfe. The Warriors are extremely proud of how Adam has conducted himself and the hard work he has put in to develop into the player he is today. 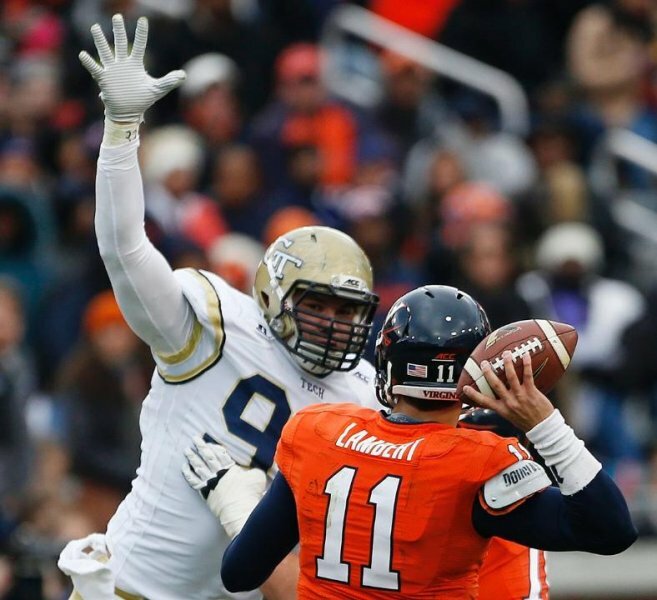 Once the Draft has settled down and Adam has settled into his new home in Denver, Wariorsgridiron.com will have an exclusive write up of the path to the draft with Adam Gotsis. 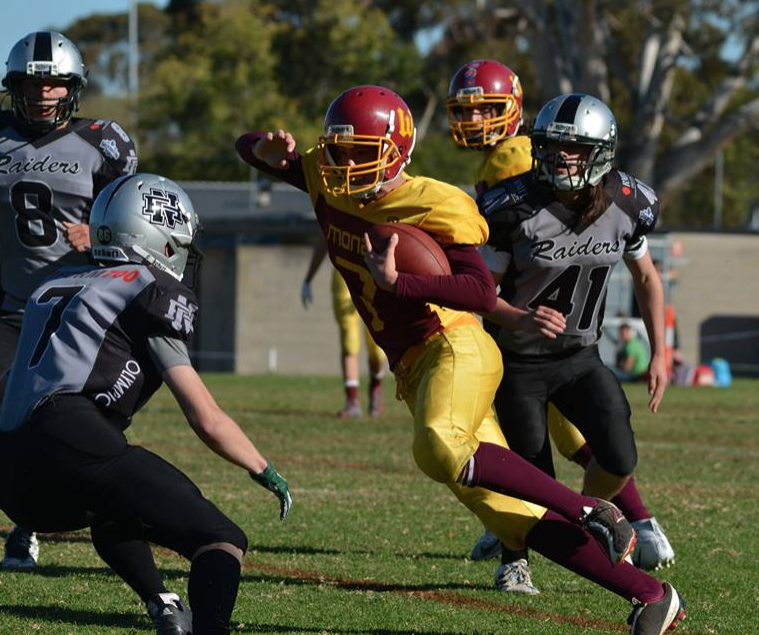 On Sunday 24th April in front of a great crowd in warm conditions, the Warriors faced a young determined Raiders outfit with a spot in the Vic Bowl on the line. 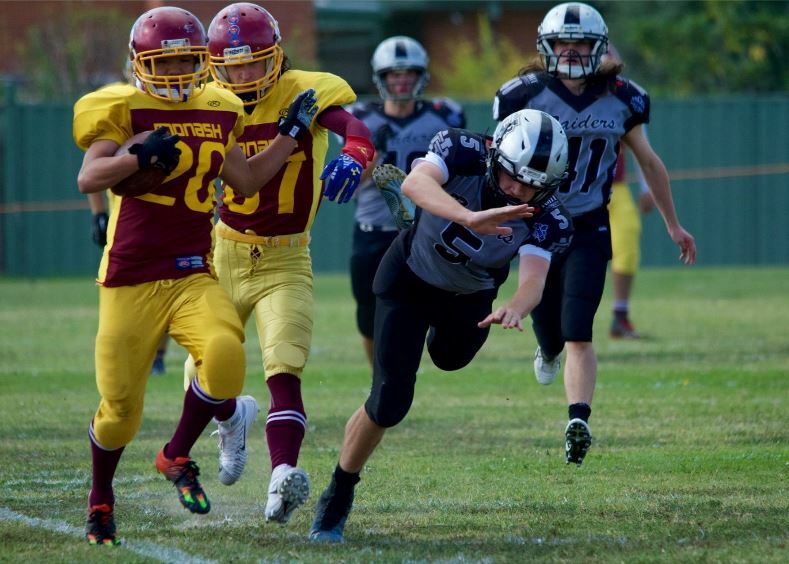 The Warriors came in undefeated and faced a team they defeated only 7 days earlier whilst the Raiders entered their first ever final full of confidence in the hope they could adjust to last week’s loss and turn the tables. The Warriors knew the tricks the Raiders had up their sleeve and the defense came out firing! The Raiders first offensive series had 2 rushes for 0 yards and an incomplete pass, and before you knew it they were punting. 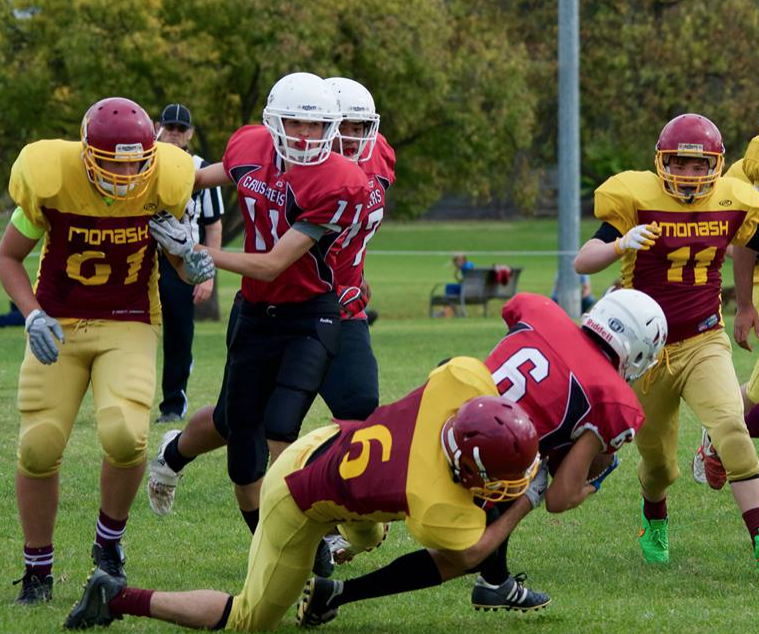 Offensive Weapon Benjamin McGaw picked up the bouncing punt and returned it 30 yards to the Warriors 28 yard line and setting up the Warriors with excellent field position. Enter QB Nicholas Whitehead who had been in excellent form of late and staring down the barrel of a 3rd and 12 decided to take on the Raiders for a 30 yard rushing TD. One series, one touchdown, Warriors lead 6-0 with 7:41 in the first. The Warriors defense entered their second series just as well as they did with their first forcing the Raiders to another rush for 0 yards, and incompletion and a 7 yard loss due to a Raiders fumble. The game was firmly in control to the Warriors and with Benjamin McGaw back ready to return another punt, all the pressure was square on the Raiders early and that showed with a fumbled snap and a punt of -10 yards, the punt sideways and out of bounds thanks to some great pressure by the Warriors. The Raiders needed to step up and their defense finally came to the rescue. The Warriors were threatening to score again deep into the redzone by the Raiders forced a turnover on downs and more importantly to them, forced a change in the momentum of the game. The Warriors defense continued their dominance but their offense started to show signs of fatigue turning the ball over with a fumble (controversial inadvertent whistle) and then Whitehead threw an interception right at the defender. The Warriors defense were able to recover a fumble of their own with just 40 seconds remaining in the first half however nothing was able to come of it with time running out ending the first half 6-0. The Warriors regrouped at the half recovering in the shade, getting their fluids up and with Coach Marini and his coaching staff making minor adjustments they were back ready to go for the second half. 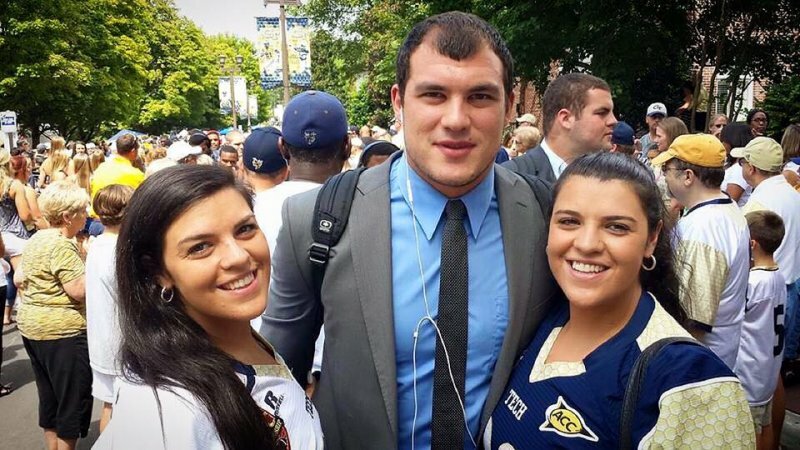 In their previous match up, the Raiders opened the game with an onside kick, something the Warriors thought may occur again so they set up for the second half and sure enough the Raiders kicked the 10 necessary yards straight to a waiting Anton Maksoutov. 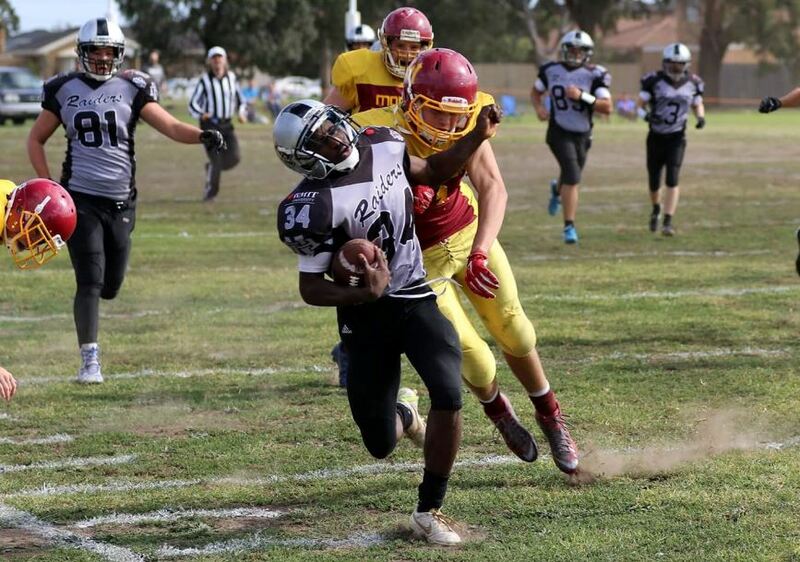 With great field position to start the second half, Whitehead looked to take the Raiders on again and from the very first play of the series scrambled for a 40 yard touchdown run along the sideline in front of the Warriors crowd. Henry Malouf was able to punch in the 2 point conversion and the Warriors were able to extend their lead to 14-0 with 9:48 remaining, only 12 seconds into the second half. The Raiders hit back immediately with an 80 yard end around with the Warriors defense over pursuing and the Raiders runner dodging tackles to find open field and the endzone to bring the score back to 14-6. The Raiders looked to get the ball back again lining up for an onside kick, this time chipping over the top of the Warriors front line and successfully diving on the ball to get possession and switch the momentum again in the game. They stretched the field with some lateral running and looked dangerous however a fumbled handoff allowed OLB Kyle Katiferis to pounce forcing yet another turnover deep in the Warriors own territory. The Warriors were hoping to give themselves some breathing space but the Raiders defense continued to shine forcing a change of possession and then with a catch and run over the middle, they were able to run it in for another score and come within 2 points of the Warriors with a 14-12 scoreline. A delay in the game due to an unfortunate injury to OLB Kyle Katiferis (broken ankle) saw the Warriors come together and work together looking for that victory. The offense were lead brilliantly by Whitehead and Maksoutov who switched from running back to tight end and ran the perfect route finding the back of the endzone for another touchdown. With the end of the third quarter and Katiferis off to hospital in an ambulance the Warriors looked poised and confident enough to finish the game strong. 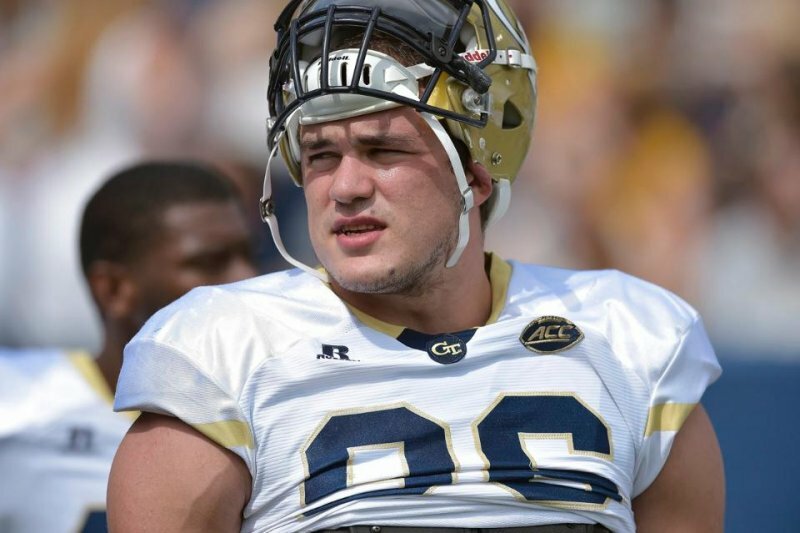 Anton Maksoutov just ran the perfect route for the previous touchdown and torched the Raiders on the ground also with a 40 yard run dodging the Raiders putting the game away extending the lead to 30-12 with 6:36 remaining on the clock. Both defences tried to hold strong for their clubs but it was the Warriors capitalising with game MVP Whitehead scrambling for his third touchdown on the day and securing the win with 2:32 left and a lead of 36-12. 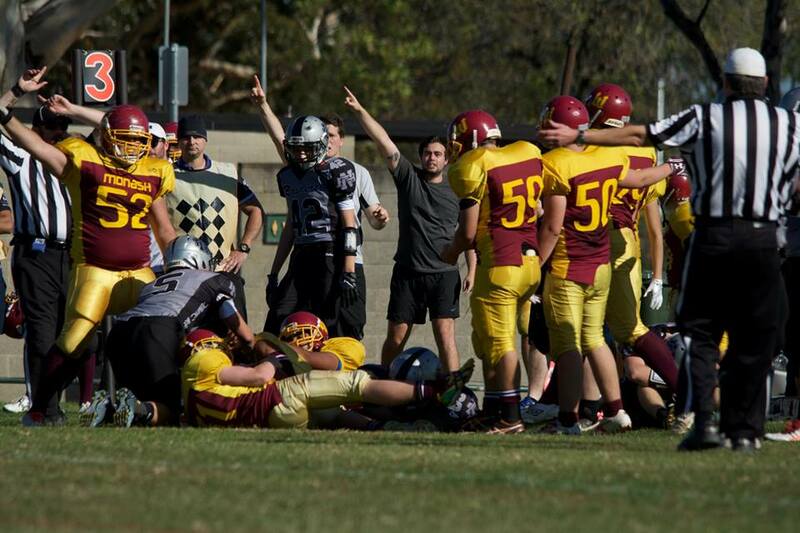 The Warriors were able to kneel the game out, extend their unbeaten streak and secure a spot in the Vic Bowl against the Melbourne Uni Lions. 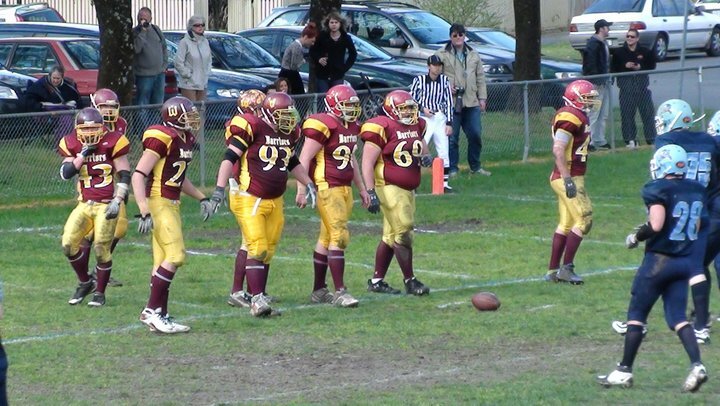 The Warriors are hoping to win their third Junior Vic Bowl (first since 2009 vs Rangers) whilst the Lions are hoping to win their third successive Vic Bowl (something no other club has been successful doing at Junior level). Kick Off will be at 3:00PM on Saturday 30th April at Heatherbrae Reserve, Arena Parade, Officer. Get down and support the Warriors and enjoy a cracking game! The Warriors headed down to Reservoir on Sunday for the final game of the regular season and a chance to finish the season undefeated leading into Playoffs. 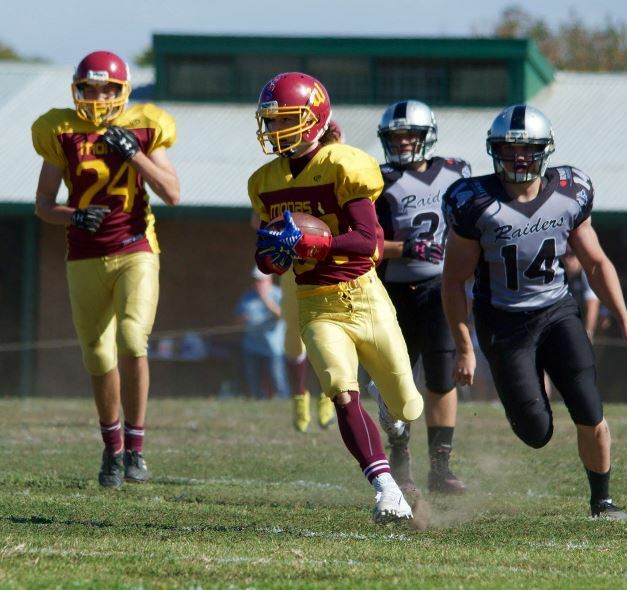 A young determined Raiders team were hoping to grab bragging rights in this contest as the teams would face off against each other next week in the semi final. This would be the first time the Raiders Juniors would be participating in playoffs and they let everyone know that. The Raiders brought some arrogance to the game because of their new feat and that was apparent with an onside kick to start the game. Not showing to be unsettled, the Warriors Offense took the ball to the ground and pounded at the Raiders. The speed option looked to work with RB Anton Maksoutov punching in the first score of the game and getting the Warriors off to a great start. The Defense came out also to a great start forcing the Raiders to punt the ball away allowing the Offense to march the field again all the way to the redzone. The Warriors were this time unable to run in another score and the Raiders force the fourth down turnover. Possession changed without any result for both teams and looked to be a defensive battle all day. The Warriors however were able to break that deadlock with a passing touchdown to TE Vishu Siakumar who has been a great redzone target, only on this occasion it wasn’t from his quarterback, it was from WR Jordan Van Buuren. The Raiders were then able to hit straight back with a returned touchdown to keep within a score of the Warriors 14-6. 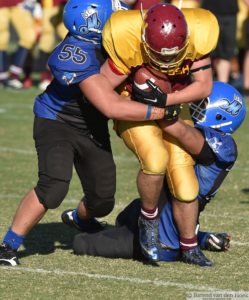 The Raiders rallied behind their defense but the Warriors kept moving the ball eventually scoring with another rushing touchdown by RB Anton Maksoutov. With time about to expire for the first half, the Raiders pull off a touchdown run as time expires and trail the Warriors at the half with a respectable 22-12 scoreline. The Warriors brought in RB Brian Huynh as a change of pace running back and he dominates the Raiders for not only his first series in the game but the whole second half. Brian would end up with game MVP for the Warriors with a 2 Touchdown performance and over 100 yards rushing (all in the second half). 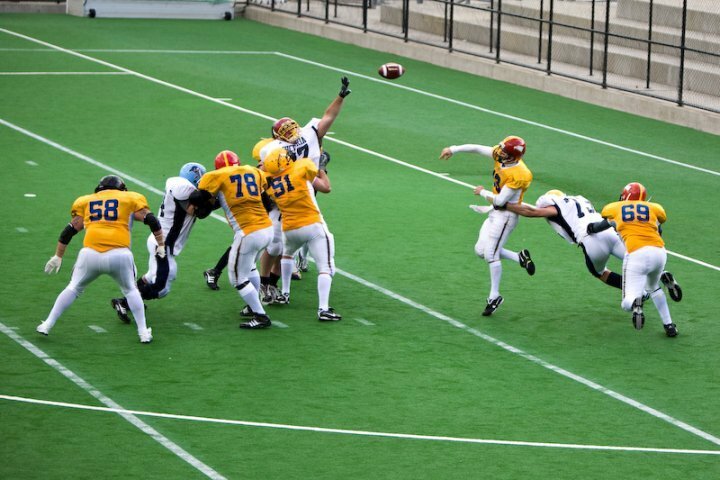 The Crunch award went to Anton Maksoutov for a massive hit on kick return, pictured below. 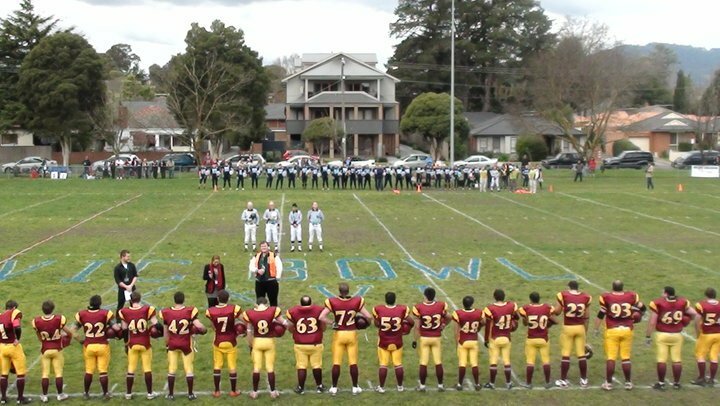 The Warriors head to Parkville on Sunday with Kick Off @ 1:30PM against the Northern Raiders which has turned into a grudge match after some online posts by the Raiders. The Warriors will come out firing! Get down there and support your Warriors! The job is not done, 2 more wins required! 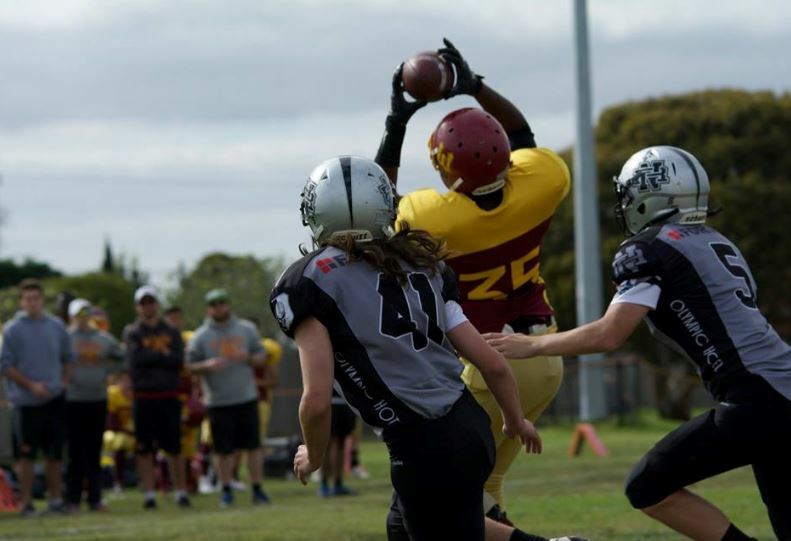 The Monash Warriors headed down to Footscray on Sunday to tackle the Western Crusaders in a game that would cement the overall #1 seed for playoffs with a win and a Norther Raiders loss. 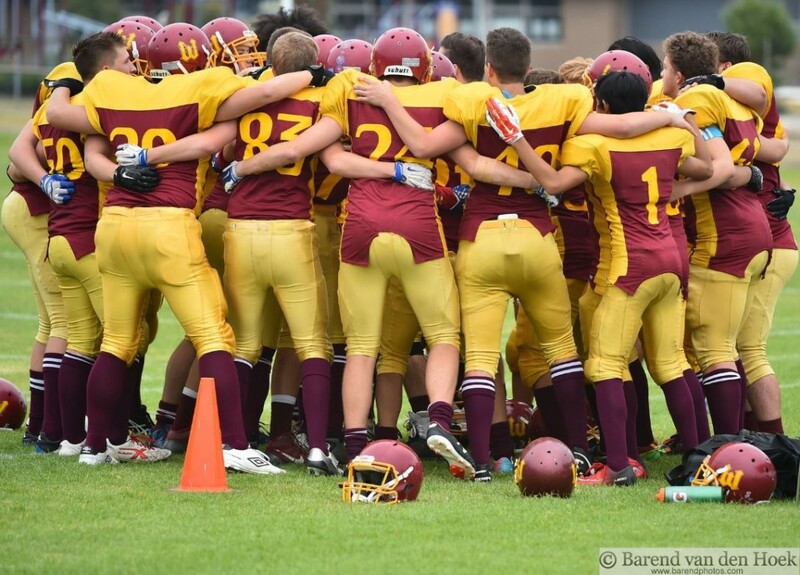 The Western Crusaders were a team struggling to find wins this season but still a determined team willing to finish the season on a high note. They had lost two of their games this season by less than a score and had those have gone the other way, they would have been in contention for the #4 seed. The day did not start of well for the Warriors as several players found themselves running late and the team captain Pradeep Rethnam had forgotten his game pants at home. Game MVP then went to Senior John Le who had brought some pants to the game straight from training at Monash University in Clayton. The Warriors were determined to fix their slow starts from previous games however found themselves concerned after all the issues prior to the game beginning. 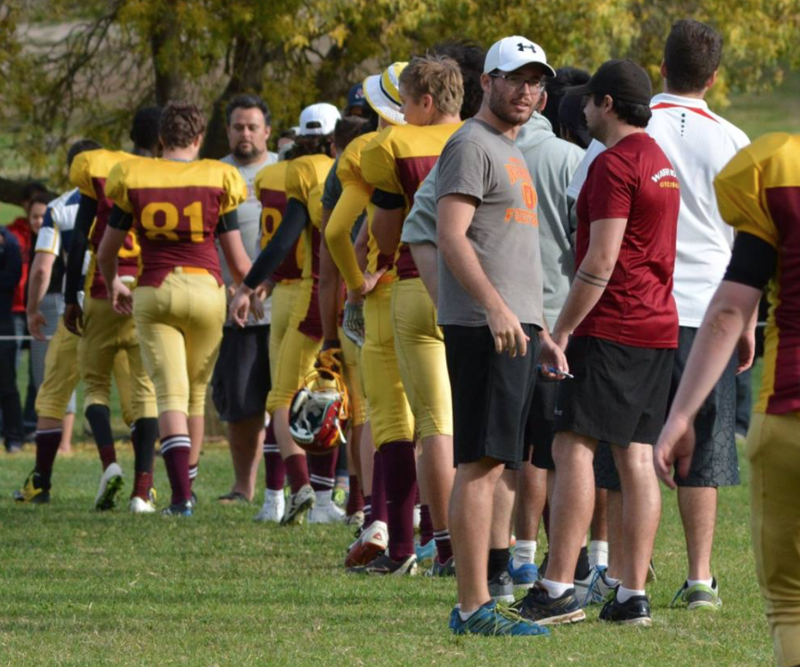 Coach Callum Marini tried to fire up his team prior to kick off and the Offense listened. The Warriors Offense took to the field and dominated the Crusaders early however QB Nick Whitehead threw his first interception since Week 3 and had the Crusaders fired up defensively and then caused problems for the Warriors when the Offense took the field. 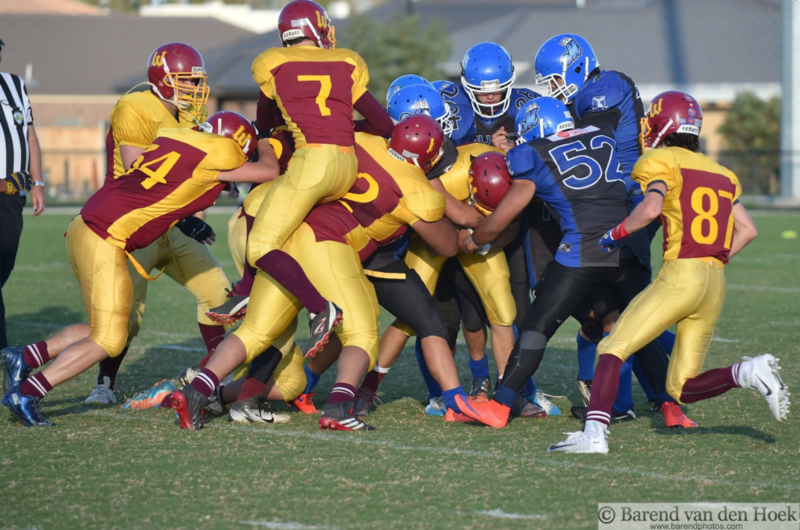 Determined to cause an upset the Crusaders scored on both their first two drives of the game coming out in formations that caused headaches for the Warriors. Defensively the Warriors had not seen these formations meaning they had not prepared for it and had no experience on how to counter it. It wasn’t until coaches Marini and Sires made changes to formations and assignments that they were able to control the game. 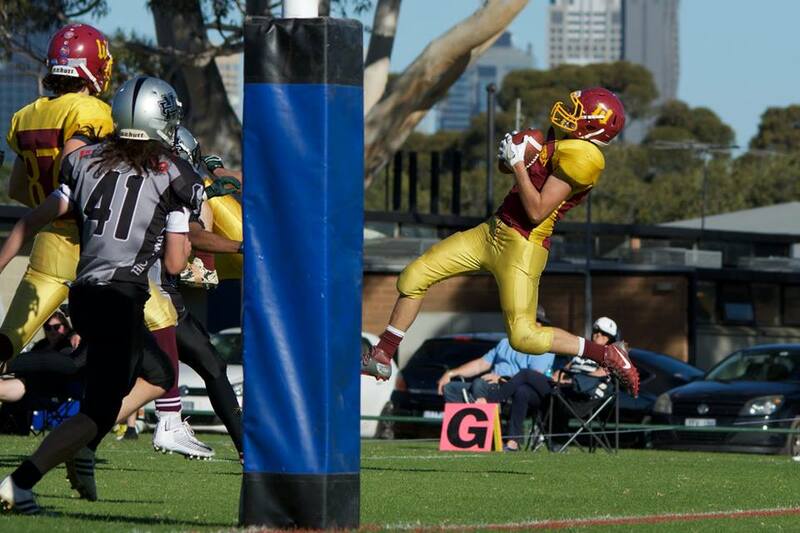 Special teams has played a pivotal role this season with the Warriors and their standout returner Benjamin McGaw was back at his best torching the Crusaders for 3 return touchdowns on the day, two coming from Kick offs and the third from a Punt. 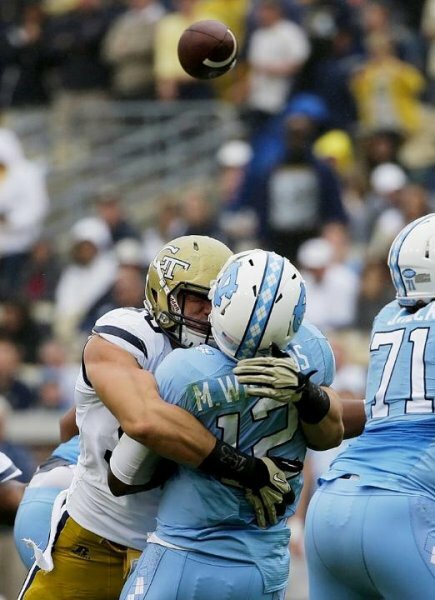 The speed and ability to make people miss has been exciting to watch but it is the teamwork of the 10 players around him on the field making key blocks which allows McGaw to find those gaps to turn into scores. 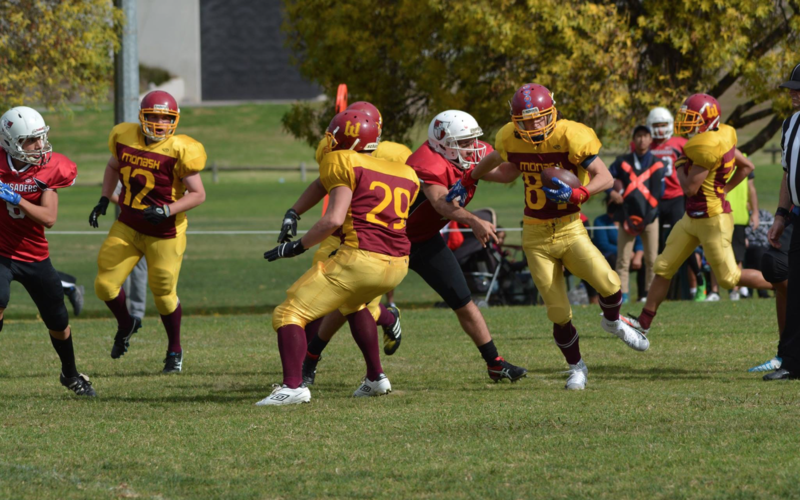 Running Backs Anton Maksoutov and Brian Huynh had big days combining for over 150 yards rushing and a touchdown each whilst Tight End Vish Sivakumar continued to impress with a touchdown of his own on an Out route. Joining the scoring party were Jono Keusgen and Dmitri Maksoutov who both scored defensively on interception returned touchdowns. That sees the Warriors Defense & Special Teams combining for 5 touchdowns on the game and the Warriors ended up easily accounting for the Crusaders running out 70-14 winners. Crunch award went to Josh Deakin who delivered a massive hit from FB on a goal line 2pt conversion. Next week sees the season finale where the Warriors will travel to Reservoir on Sunday 17th April and face an improving Northern Raiders team that have cemented a playoff spot for the first time in their young Junior history. The Warriors can’t afford to slip as form at this time of the year is crucial. 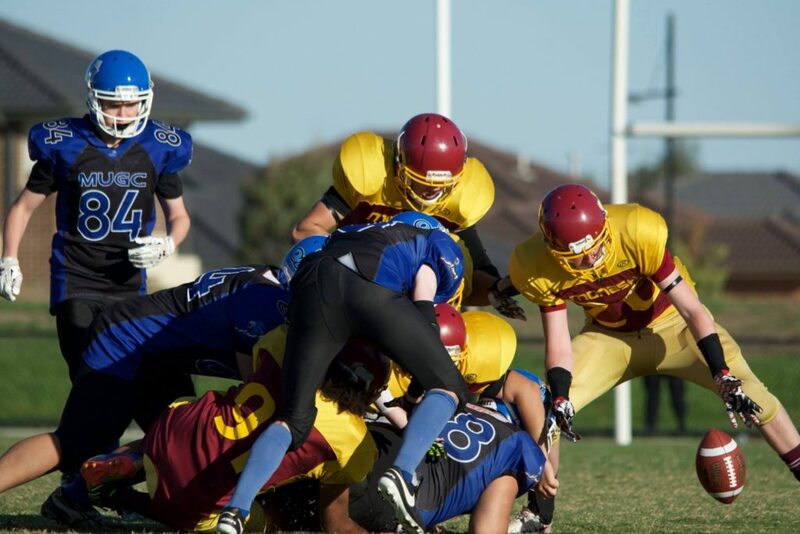 Whilst they have cemented top spot after the Northern Raiders lost to the Melbourne Uni Lions in the lead up game in Footscray, the Warriors still need to be on top of the game if they wish to complete the perfect season. The Warriors will face either the Packenham Silverbacks or Croydon Rangers who are both fighting for 4th position and hope to defeat them to face either the Northern Raiders or Melbourne Uni Lions who will face off again in the semi finals. 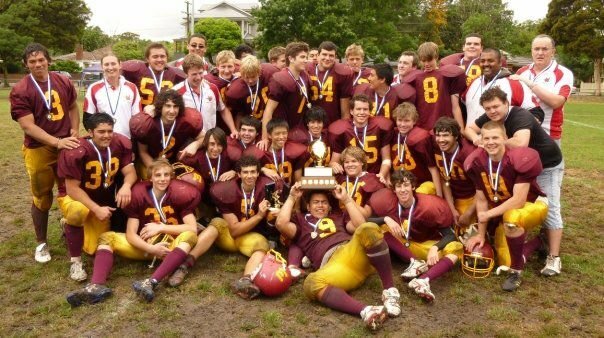 Get down to Reservoir and support the Warriors in their quest for the perfect season.